When my mum offered to take the family to London for a week during the Xmas period I thought “Great, one week away in good old London” and then I thought “Hey ! 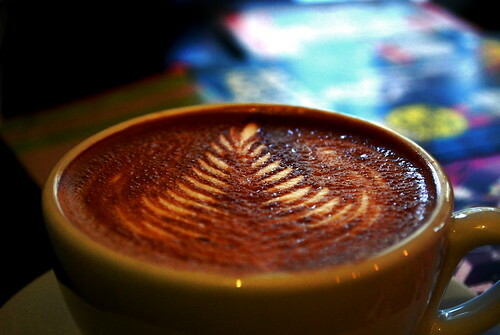 now I can check those coffee shops that I missed in London last summer”. So to start of the “New” Year, I guess it is apt that I start of with “New” coffee shops in my favourite coffee city, London. So, as promised in my post of 17 October 2008, this time I found the new Flat White coffee shop, called the Milk Bar, located on 3 Bateman Street and also in Soho. 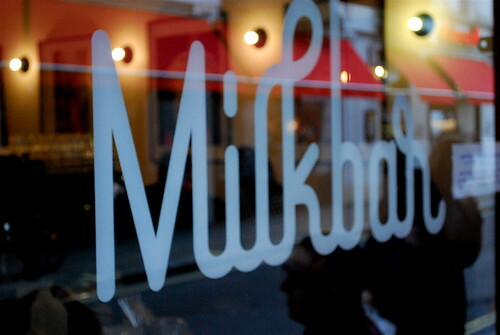 Milk Bar is on a busy street in Soho and it has a bit of a different vibe to Flat White. For one, it seems like there’s a little bit more space, which doesn’t make it as cult and cosy as the original Flat White. They also offer cakes and snacks and naturally the star of the shop, the customized black La Marzocco is centre stage almost right in front of you when you enter the shop like a display. There are some seats outside the shop. Milk Bar has a bit of a psychedelic feel to it and I think that is what inspired me to add this psychedelic tint to this freshly poured Flat White, which I had to order naturally being in Flat White’s second shop. 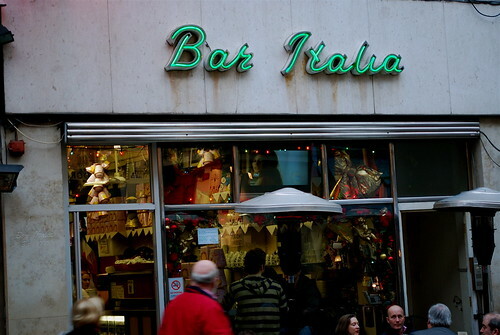 Not too far from Milk Bar is one of Soho’s landmark drinking establishments, Bar Italia, located on Frith Street. Bar Italia is appealing to its followers not only because when you enter you think you are in Italy with tiled floors, manual lever ancient espresso machine, 1960’s style ring register and that continental feel but because it is one of very few coffee bars that is open 24 hours a day – “Now how cool is that ?” (one of my wife’s famous quotes). It is kind of assuring that if you are out late in central London and really want some good tasting Italian espresso, then you can find a coffee shop open all hours, where you can get one. So going with the flow being in a little bit of Italy in downtown London, I ordered an espresso naturally. It had a very Italian taste and I’m guessing that the coffee beans had both arabica and robusta in them, just like the Italians like. In any case, my visit in the afternoon was quick and Bar Italia was quite empty compared to the last time I walked past it, when I walked on by because the crowds were spilling onto the street. For my next stop, you will have to take a taxi (if you are in a hurry and can afford one) or jump on the Tube (London’s underground rail network system) and head for probably London’s most famous department store, Harrods. Ok ! for those who know Harrods, it is located in the most prestigious and expensive part of London and probably the UK, and Harrods is not a cheap store either. In any case, I was drawn here because during my attendance at Caffe Culture, May 2008 (see my post of 30 May 2008) I spotted a Mirage La Marzocco machine owned by a coffee roasting company called Andronicas World of Coffee. I was duly informed by the owners that they were located in Harrods (confirmed by a blog post in coffeegeek.com) and as the Exhibitors gave me a voucher for a free espresso at Andronicas, I thought on my next trip to London, I’ll try out their cafe at Harrods. I’ve been trying ever since, until now in the middle of the shopping frenzy that is London in late December, I dragged my 7 year old son to Harrods with a promise to visit the toy shop there. 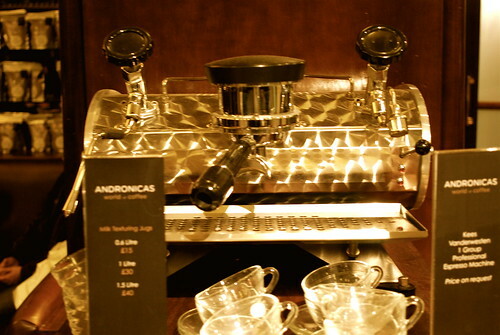 Andronicas is located on the 4th floor of Harrods, set in a pristine environment that inspries you to relax and take it easy. They’ve got lots of coffee stuff around their seating are like cafetieres, coffee cups and this antique looking mini-espresso machine, which I couldn’t resist taking a picture off. 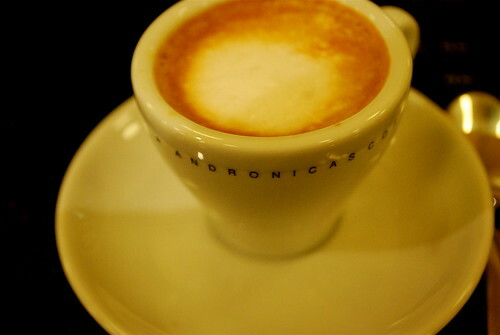 Being late afternoon, I ordered an espresso macchiato from the barista. Now ! that’s really unique and if I had a specialist coffee shop I would follow this example. Sadly, because I was in a rush and had to take my son to the toy department I missed out on this opportunity, Ahhhhh ! 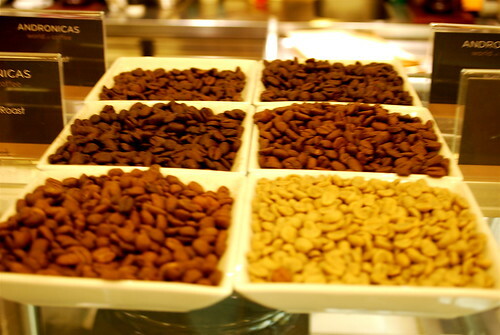 However, I was informed that as Andronica have been supplying freshly roasted coffee to Harrods for over 20 years, I could get some coffee downstairs in the famous Harrods food hall. I rushed down there but the special 1849 blend was naturally sold out, so I bought two other varieties (more of that in my next post God willing). and if you can, I strongly recommend ordering their coffee (they might ship outside UK – I’ll check God willing and let you know) a visit and would like to confirm that Harrods is the best department store that I have been to, to buy freshly roasted coffee, because their coffee is roasted by serious experts and people committed to quality, who ensure that Harrods receive freshly roasted coffee twice a week in order to maintain the quality and of course their reputation. 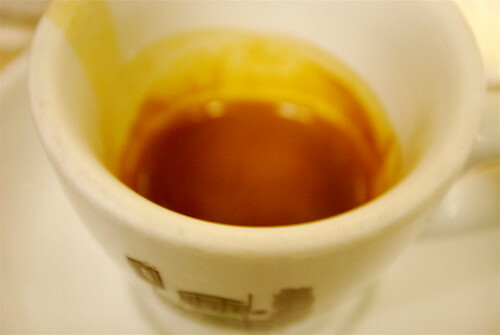 This entry was posted on Friday, January 9th, 2009 at 12:00 am	and tagged with Andronicas, Bar Italia, Bean There - Cafes, flat white, Harrods, latte art, london, Milk Bar, rosetta, soho and posted in Bean There - Cafes, Coffee News, The Art of Coffee. You can follow any responses to this entry through the RSS 2.0 feed.